Apple Looks To Compete With Netflix Originals, But Making Hits Is Hard : All Tech Considered Apple is about to join Amazon and Netflix and get into the content-making business, sources say. Apple stands to boost revenue, analysts say, but finding success in Hollywood isn't easy. 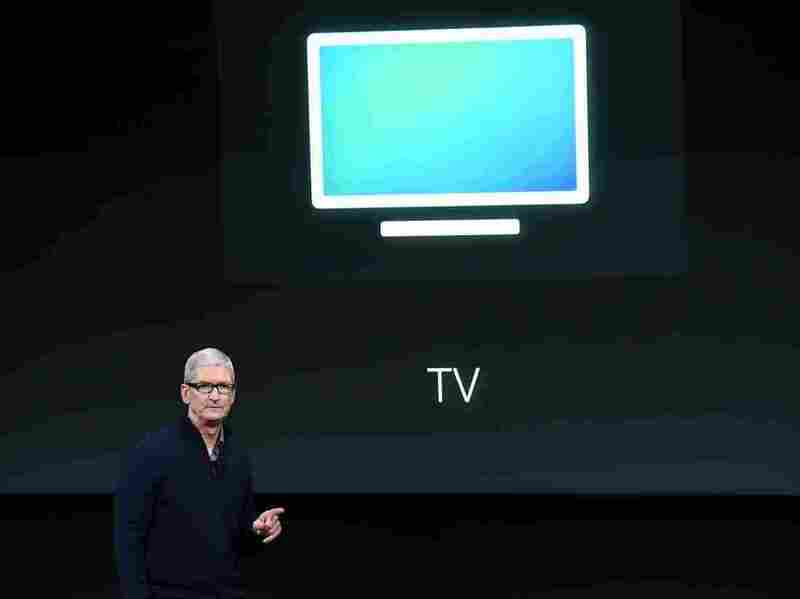 Apple CEO Tim Cook introduces the new Apple TV app during a product launch event in Cupertino, Calif., in October. The company now plans to make original movies and TV programming, according to sources. When producer Sid Ganis first heard that Apple wanted to make TV and movies, "I thought to myself, 'What? And why?' "
As a former president at Paramount Pictures, Ganis had a hand in films such as Top Gun, Ghost and Forrest Gump. He is also someone who uses Apple products and thinks the company is really good at making hardware. So, Ganis says, "It seemed odd that they would take that really big gigantic leap into creating content. Content is not very easy to figure out." But Apple sales fell last year for the first time since 2001 — largely due to less demand for its latest iPhones. Apple isn't commenting about its plans for TV and film, but the right content could help boost sales of Apple products, says Brian Blau, an analyst with Gartner who follows Apple. "Having original content is a strategy that is simply just going to bring people back to Apple. I think this is going to represent a unique opportunity for them," Blau says, "one that's going to make them more competitive with these other original content providers that potentially have been drawing Apple users away from the Apple ecosystem" — like iTunes and the App Store. Those original content providers include Netflix and Amazon. Netflix has done an especially good job at creating content that draws in subscribers for its services. According to the measurement service Symphony, last year Netflix originals like Orange is the New Black and Fuller House were viewed by close to 16 million viewers each. Last quarter, Netflix flew past Wall Street expectations and added some 7 million new subscribers in the U.S. and abroad. Blau thinks even though Netflix is available on Apple devices the company may want to have some programming that is under its control. In part, because the market for iPhones is getting saturated and it needs other sources of revenue. "I think Apple's just trying to find their place and how they can capture some of the revenue in other ways," Blau says. "And this sort of TV and video and music content I think is just going to be one more pillar that they're going to be able to stand on over time." And that's just fine with Hollywood producers like Art Linson. Among Linson's executive producing credits are the hit series Sons of Anarchy. Linson says old-time Hollywood studios have become too risk averse. "And it opened the door a long time ago for people to say, 'Whoa! We'll go into that. We're going to do something interesting and let's see how it goes.' " Linson thinks that's why Netflix and Amazon are doing well. "Because they're smart — they [said], 'We're not scared.' "
And Amazon and Netflix spent serious money. Netflix put a $100 million bet on its first foray into original TV — House of Cards with Kevin Spacey. Netflix took it on after it had been turned down by HBO, Showtime and AMC. But no matter how much money you have, there are challenges, says producer Sid Ganis — especially for a company like Apple, which has never produced TV or film. "It doesn't matter that they have $200 billion in the bank. It matters that the writer and the director are in it for the emotional ability to move us as viewers," he says. And making a hit is hard. It requires the right talent and no small amount of luck. As any number of Hollywood producers will tell you, no one ever starts out planning to make a flop.